When I got my very first particle counter, I tested sites around Beijing to see whether indoor air quality was better than outdoors. It was. But that test had some limitations. My first particle counter didn’t have a battery, so I had to estimate outdoor particulate in some locations. I also didn’t look into any variables that could give some indoor locations better air than others. 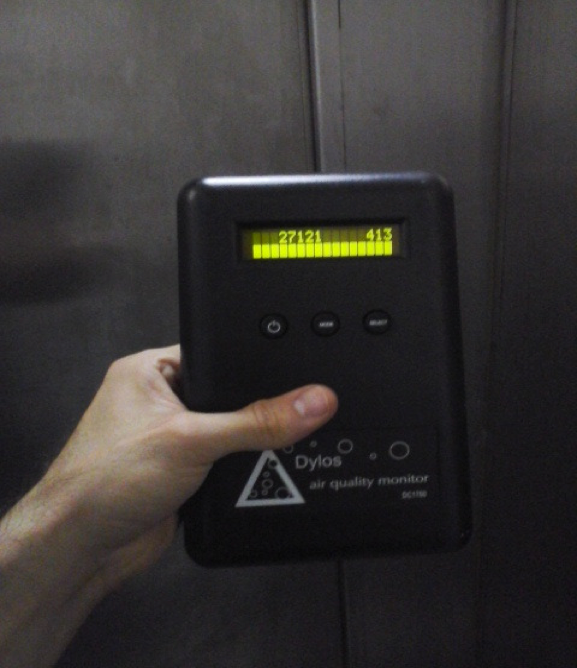 Now I’ve got a fancy new Dylos DC1700 battery-power particle counter! Now I can easily take measurements indoors and outdoors. I took it to Shanghai and tested 14 times in 11 locations on August 27-29. While I was there, the AQI averaged 158 (70 micrograms). I tested mostly around the French Concession, although I also made it out to Fudan University. None of the locations used air purifiers. 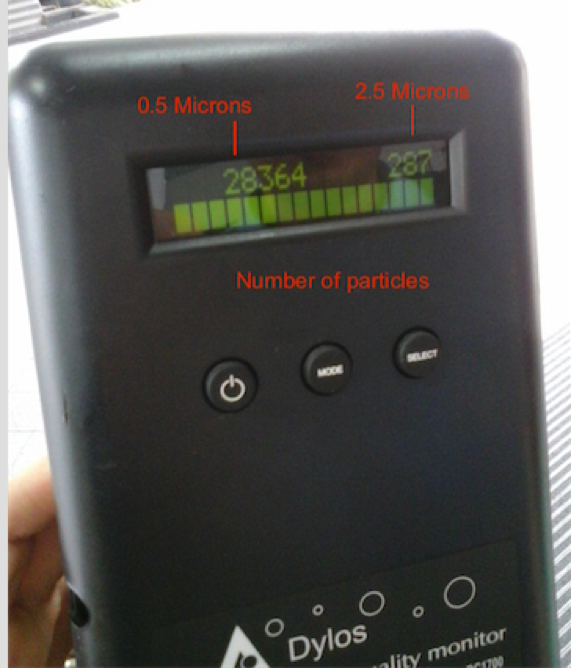 I focused on the smaller 0.5 micron particles (which are highly correlated with the government’s PM 2.5 readings). Across the 14 samples, here’s what I found. The red line represents the particulate levels of outdoor air. Any number below that line means air indoor had less particulate than outdoor air. On average, indoor air had just 69% of the particles of outdoor air. This fits with my findings in Beijing–indoor air has less particulate than outdoor air. But next, I wanted to see if I could figure out why some places had cleaner air than others. For example, my unpurified apartment air (unpurified because I just got home) had just 30% of particles compared to outdoors, but the public bathroom had 134% of particles compared to outdoors. Woah! I tested the simplest explanation possible: Were the windows and doors open? Most particulate pollution comes from outside. And in closed rooms, particles will slowly fall to the ground. Thus, indoor air should be better when the windows are doors are closed. In places where the doors and windows were closed, the air was always better than outside. The one exception was the Yuanyuan Restaurant, at 115%. Those particles could be coming from the kitchen. The conclusion here is simple: We’re usually breathing much less particulate indoors than outdoors–even without a purifier. Work out indoors if possible. I work out indoors in a gym rather than outdoors when I’m in China. Sit inside at cafes or bars (unless people are smoking). Does that mean indoor air is safe? Finally, remember that pollutants can sometimes come from indoors. This is usually from the paints and chemicals used in remodeling and new furniture. If your home smells like paint or new furniture, you may be safer opening the windows (or at least using activated carbon). P.S. How is indoor air quality in India? Hint: it was different from China. Check out what I found when I tested indoor and outdoor particulate pollution in Delhi.